Austin Fiala temporarily resigned as Associated Student Body attorney general yesterday, creating conditions that would allow him to run in the 2019 general election. His resignation came just before the ASB election petitions were released today. Because it is the job of the attorney general to oversee the elections process, the attorney general is the only position in ASB where the officer must step down to run for re-election or any other position. The ASB Code and Constitution stipulates that the attorney general may not run for any elected office, but Fiala will be returning to the position following the general election and before the inauguration of the 2019-20 attorney general. In Fiala’s absence, ASB President Elam Miller named junior public policy leadership Anya Czerwinski to serve as interim attorney general, making her the third student to hold the position this academic year. Czerwinski has worked in the ASB Department of Justice for the past three years and most recently acted as deputy attorney general of the ASB Code and Constitution. Since the last election cycle in spring 2018, ASB created the Elections Reform Task Force to address concerns of Greek organizations’ influence on elections. The effort is led by Katherine Sistrunk and Leah Davis, co-director for inclusion and cross-cultural engagement for ASB. In August, then-Attorney General Sistrunk stepped down from her position after realizing her benefit from being affiliated with a Greek organization while campaigning. However, ASB has not yet made any substantial changes to election and campaign rules that will affect this election cycle. On Feb. 26, the ASB Senate passed a bill shortening the campaign period from 16 days to 12 days. However, Czerwinski said because the bill was passed so close to the spring elections, the change will not go into effect until the fall. 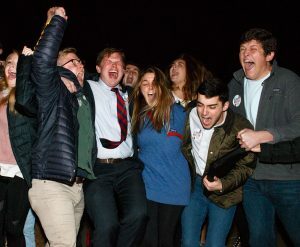 “We think that it’ll make the election process run more smoothly, and to put it briefly, it’s what everyone — our office and students — have wanted for a long time,” Czerwinski said. The senators who authored the bill worked alongside Fiala and the Elections Reform Task Force to decide on the 12 day period.